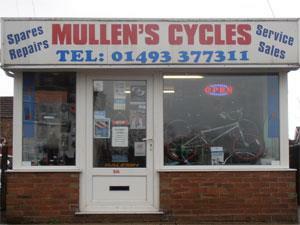 Mullen's Cycles, at Caister-on-Sea near Great Yarmouth, are a bicycle retailer, spares and repair outlet. On arrival in Great Yarmouth follow signs for the A149 to Caister-on-Sea proceeding stright ahead at the mini roundabout at Yarmouth Stadium on towards the village. Mullen's Cycles are located a short distance along on the right hand side.